In 1965, the Indonesian government was overthrown by the military. Anybody opposed to the military dictatorship could be accused of being a communist: union members, landless farmers and intellectuals.In less than a year, over one million 'communists' were murdered - and the perpetrators still hold power throughout the country. 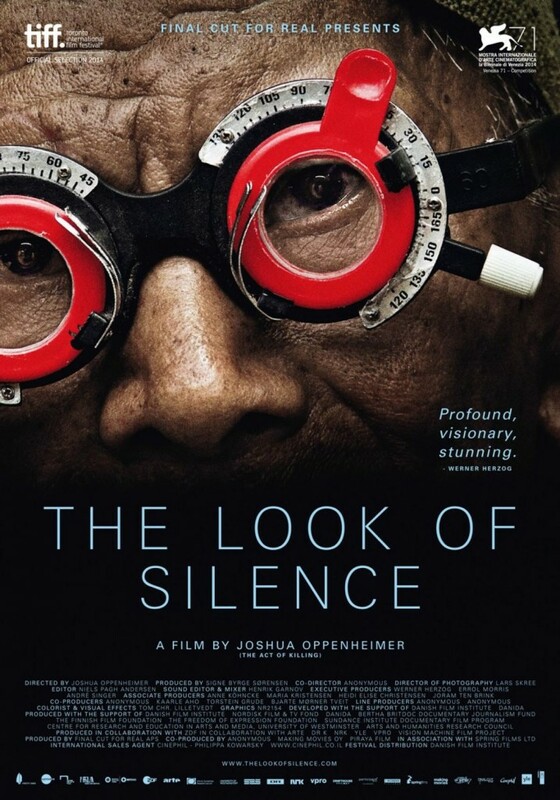 The companion piece to the 2013 Oscar nominated documentary The Act of Killing (which I also reviewed), The Look of Silence has been hailed by critics and audiences around the world for bearing witness to the collapse of 50 years of state-sanctioned silence. This is a specific story of one family who confronts the men who killed one of their brothers. Children are taught in school that General killed and jailed the communists because they were bad and needed to be punished. It is bone chilling to watch these Generals speak of how they murdered. They describe taking a life-like a replay of a basketball championship or telling a joke they enjoy. Why do think some human being will find a way to justify taking a life. A life that was someone's husband, wife, son or daughter? For the people of Indonesia it was an everyday occurence. They destroyed so many people and now they get to live to enjoy life. As dark and disturbing as this piece is, there is a light moment when the family is discussing an elder's age that is absolutely hysterical. However, murder by and large is no laughing matter. When the film was screened in Indonesia earlier this year it was greeted with a 15 minute standing ovation. Nominated for an Oscar earlier this year, The Look of Silence has now been screened over 6,000 times including by the Indonesian government itself. The film was banned by the government's film censorship board, which is associated with the army. Shortly after airing on PBS on June 27, 2016, an international panel of judges concluded that Indonesia's mass killings of 1965 were crimes.Their report estimates that 400,000 to 500,000 people -- believed associated with the communist party, were killed by military deaths squads, but indicates that official secrecy around these numbers makes the actual figure hard to gauge. The panel, led by head judge Zak Yacoob, a former South African Constitutional Court Justice, held a four-day hearing in the Hague in November 2015, where they heard over 20 witnesses, some of whom gave evidence behind a screen to protect their identity. Living here in America, we often forget how much of a privilege freedom is and that many others around the world pay an enormous price for just a taste of what we take for granted. I highly recommend watching The Look of Silence if for no other reason than to educate yourself on what it is like to live in amongst a government that clearly has no respect for human life. Be thankful this is not your daily reality and try to be more giving, loving and understanding of your fellow-man or woman.